Urinary incontinence is not a disease. It is a symptom of a wide range of conditions. Urinary incontinence is the uncontrolled leaking of urine. More than 30 million American men and women suffer from urinary incontinence. A urologist or other health care provider will ask questions about your habits and fluid intake. He or she will also want to know about your family, medical and surgical history. A medical exam will look at reasons for leakage that can be corrected. This includes impacted stool, constipation, and hernias. Your health care provider may recommend tests such as a cough stress test. He or she may conduct a urinalysis, which is a test of your urine sample that can show problems of the urinary system, or urodynamic testing, which includes several painless tests. Some of the causes of incontinence are temporary and easily reversible. These include urinary tract infection, vaginal infection or irritation, medication, constipation and restricted mobility. Although pads or diapers may prevent embarrassing leakage, other treatment options currently available can eliminate your need to wear such protection. The options listed here are good ways to start taking control of your bladder. Anticholinergic drugs can treat urgency incontinence. They allow the bladder muscle to relax. These drugs work well to treat urgency incontinence but may have side effects. These may include dry mouth, confusion, constipation, blurred vision and an inability to urinate. You may also be using other medications that cause the bladder muscle to relax or the smooth muscles at the bladder neck to contract, so you should mention these to your health care provider. If you have incontinence after menopause, you may benefit from hormone treatment. 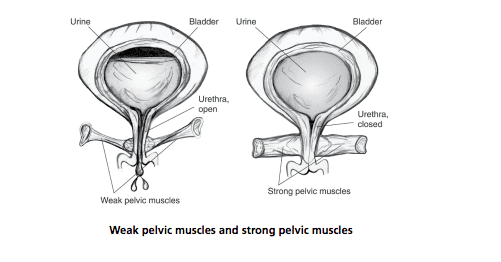 Hormone replacement may improve the health of the bladder neck and urethral tissues. This may help incontinence symptoms. There are some medical reasons not to use hormones. Speak to your health care provider about the best treatment options for you.